LAHORE, July 1: Fear gripped the city on Thursday night after two blasts in the space of a few minutes at Data Darbar left 36 people dead and more than 175 injured. 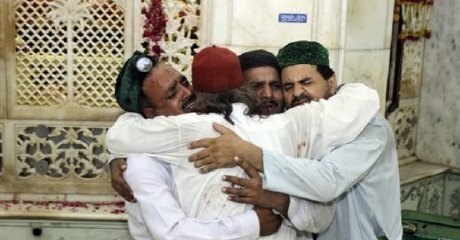 The Lahorites were dazed by the attack at the shrine of a saint who is revered as the true custodian of the city. The attack came on a Thursday, considered as a holy day by the faithful. On Thursday nights and early hours of Friday, Data Darbar usually bustles with people: men, women and children, from near and far. The bomb attacks took place despite the fact that tight security arrangements were in place in the metropolis, which on the other hand led to the uneasy feeling that the law enforcers had some intelligence about the possibility of a terror strike in Lahore. In the days preceding the suicide explosions, the Lahore police had conducted house-to-house searches in many city localities, rounding up scores of people for questioning. The area around Data Saheb was also combed thoroughly in recent days. According to details available with Dawn only one of the many gates to the shrine was open and everyone who entered was frisked. Yet the terrorists wearing heavy suicide jackets managed to sneak in. The caretakers and other witnesses said one of the two suicide bombers blew himself close to the area where the visitors perform ablutions (wazoo) while a second bomber exploded the device tied to his person in a courtyard inside the shrine complex. A caretaker told media that given the law and order in the country, there was this constant threat posed to the darbar and those who visited it to seek the Data Saheb’s blessings. He said the incident happened despite the fact that security around the shrine had been beefed up. And it appeared that the terrorists are determined to kill anywhere, the blasts at the shrine removing the (false) sense of security that desparate people are wont to use as a shield in times dangerous. Until now the feeling had somehow survived that the terrorists had some specific target -- the enemy -- in mind. If somehow the theory is still valid after the Thursday night’s indiscriminate aiming at hundreds of faithful gathered at the shrine, it will have to be said that few will be able to claim with any confidence that they are safe from the terrorists’ onslaught. The government did attempt to restore public confidence with statements issued in the wake of the attack, but of greater significance on Thursday was the rescue work the government workers undertook along with volunteers. A large number of the injured were taken to Mayo Hospital. Mayo Medical Superintendent Dr Zahid Pervez said many of the wounded were in serious condition. Some of the injured were rushed to other government-run hospitals in the city.